More than one year after Colonel Jack O’Neill and archaeologist Daniel Jackson defeated Ra on the planet Abydos (“Stargate” the Movie), the ancient alien artifact called the “Stargate” sits deep within a U.S. military mountain facility, covered and unused. A group of Air Force personnel sit at a small table in the gate room and play cards. The room begins to shake, and soon the Stargate flares into action. A wormhole opens and a group of alien soldiers, in serpent armor, come through and engage the soldiers in battle. Another figure steps through — this one armored in gold — and takes a female sergeant back through the gate with him. Earth has been invaded. The Stargate program is reactivated to determine the nature of this new threat, and how to eliminate it. Major Samuels, executive officer of General Hammond (now in charge of the Stargate program), finds Colonel O’Neill. The soldier must return to active duty from retirement after Hammond forces him to confess that his report on the first Stargate mission was falsified. The Abydos Stargate was never destroyed, and Daniel Jackson is alive and well and living with the people of Abydos. Along with Captain Samantha Carter, an expert on the Stargate technology, O’Neill returns to Abydos and finds Jackson. Jackson takes the group to a room he has discovered in the caves: it is an ancient alien map room, listing thousands of Stargate addresses. The Stargate system is indeed a vast network, linking infinitely more planets than Earth and Abydos. While they are gone, the young boys of Abydos continue to guard the Stargate. But powerful forces overcome them. It is the same serpent guards, who kill many of the boysand take two people — O’Neill’s friend Skaara, and Jackson’s wife Sha’re — back through the Stargate. 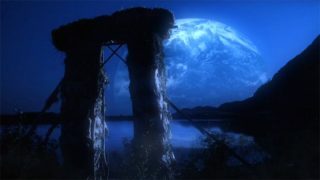 The team arrives back to discover the abductions, and Jackson is convinced to return to Earth in the hopes of finding his wife somewhere through the Stargate. He instructs the people of Abydos to bury the gate for one year. If he does not return with Sha’re on the day they unbury it, they are told to bury it again — this time, forever. Meanwhile, Skaara and Sha’re have joined many other people in a giant holding cell — some sort of dungeon in a giant castle. The leader of the guard comes and chooses one woman, who is brought before his leader — who’s eyes glow, just like the alien Ra. It is the missing sergeant from Earth. She is stripped naked and examined, then presented to an alien queen — a wormlike organism that resides within the belly of a host woman. The women are being collected from all across the galaxy as potential hosts for this parasitic being, the mate of the serpent leader. The sergeant is rejected by the worm, and the gold-clad alien kills her. Indeed, O’Neill, Jackson, and Carter conclude, Ra may not have been the last of his race after all. They are assigned to a new field unit: SG-1, whose mission is to perform reconnaissance, determine threats and make peaceful contact with the peoples of alien worlds. Ferretti, one of O’Neill’s men from the original Abydos mission, was in the gate room on Abydos during the attack, and is now in the infirmiry at Stargate Command (the “S.G.C.”). Feretti managed to memorize the address of the world to which the aliens escaped, and provides it for SG-1 after he regains consciousness. Back in the palace, the alien queen has chosen her new host: it is Daniel’s wife Sha’re. She is terrified, stripped naked by the guards before the giant worm burrows into her neck and takes over her body. SG-1 and SG-2 (the latter commanded by Major Charles Kawalsky) travel through the gate, and find a beautiful forest world. They come across a group of worshippers, and are led to the city of Chulak. There they meet the alien leader and Sha’re, his new bride, and are thrown into the dungeon with the refugees. Jackson identifies the leader as Apophis, a god from Egyptian mythology who ruled the night and was a great enemy of Ra. The leader of Apophis’s guard notices O’Neill’s digital wrist watch, and is puzzled. “This is not Goa’uld technology,” he says. He learns that SG-1 is from Earth, and begins to reveal that his loyalties are not entirely with Apophis. Soon, Apophis enters the dungeon accompanied by a group of alien “Goa’uld” — parasites who forcefully inhabit human bodies as hosts. Each Goa’uld couple has come to choose a host for their child — to determine who among the refugees will become the “children of the gods.” A few are selected and dragged away screaming — including Skaara, O’Neill’s close friend from Abydos. Apophis orders the rest of the prisoners killed, and the guards begin to open fire as the Goa’uld leave. O’Neill shouts to the leader of the guard: “I can save these people! Help me!” He has sensed the man’s waivering loyalties, and his plea is heard. The guard tosses his staff weapon to O’Neill, and turns and fires on his own soldiers. The guards are overcome, and SG-1 escapes with the refugees back toward the Stargate. Apophis and Sha’re exit the gate to another world. When SG-1 arrives, Skaara is about to leave through the gate. He turns and walks back toward O’Neill, then shoots him with a hand device. Skaara’s eyes glow brightly — he has been taken as a host. Skaara and those with him leave through the gate, and Daniel dials Earth as an army of guards — called Jaffa — approach from the woods. SG-2 engages the soliders, and an alien worm leaps from a fallen guard into Kawalsky. But the humans escape back to Earth, just in time to meet General Hammond’s do-or-die deadline. O’Neill recommends the Jaffa guard, Teal’c, for membership on SG-1. The team must continue to travel through the Stargate — to locate new technologies, to assess threats to Earth from offworld, and to find their missing loved ones. The alien soldiers — “Jaffa” — have a pouch in their bellies slitted in an X formation. The Jaffa serve as incubators for Goa’uld larva, and all Jaffa carry a larva from childhood. Upon reaching maturity, the Goa’uld parasite is removed and planted within a host body. Without its presence, the Jaffa would die. In fact, it gives them perfect health and long life, according to Teal’c. The Stargate resides deep within the Cheyenne Mountain Complex, which appears to be different from the film. Perhaps the Stargate has been moved within the past year, and a new (identical) facility constructed for it. O’Neill theorizes that because they defeated Ra, the aliens now consider Earth a threat, and will come in ships to attack. This is his argument against burying the Stargate, though he didn’t think it important enough to mention after returning from Ra’s defeat. Certainly, though, O’Neill didn’t know that there were others like Ra (he was told that Ra was the last of a dying race) until Apophis came through Earth’s Stargate. It is curious that the Stargate remains at the mountain facility at all, since Jackson and O’Neill concluded after meeting Ra that it was the gate on Earth that posed a problem, and had to be destroyed. To create a stable wormhole, the Stargate releases a tremendous amount of energy. It must be powered from a strong generator within the mountain complex. On other worlds it is controlled (and presumably powered) by a “dial home device,” where the user need simply to touch the symbols in the address and “dial up” a planet. This device was missing from the Giza, Egypt dig where the gate was discovered on Earth. According to Carter, it took 15 years and three supercomputers to make the gate work. Most of the Abydonians — especially Skaara and Sha’re — seemed to have learned a great deal of English from Daniel over the past year. About a month after the first Stargate team returned to Earth, Jackson discovered an ancient map room in a cave on Abydos, perhaps left by the builders of the Stargates. The walls of the room are covered with lists of addresses for Stargates all over the galaxy, neatly ordered into local groups. Daniel had even mapped some of the constellations represented there in the Abydonian night sky … or at least pretty close. Daniel has not been able to dial to any other planet yet, likely because the addresses of many planets change slightly over thousands of years, due to the theory of planetary drift. The gate may have worked between Earth and Abydos because they are relatively close in the universe — less distance means less relative drift. Carter theorizes that the S.G.C.’s computers can adjust for the changes using the map as a basis, and thus correct out-of-date addresses. The evil Goa’uld Ra was not the entity upon which the ancient Egyptians based their religious mythology. Ra assumed the identity of the mythical god and impersonated him on Earth. Presumably, other Goa’uld — such as Apophis — have impersonated other gods from Earth’s history. The president of the United States has authorized the formation of nine Stargate teams, designated SG-1 through SG-9. Their mission is to perform reconnaissance, determine threats, and make peaceful contact with the peoples of other worlds. No one will know of their existence other than the president and joint chiefs. These teams will operate out of Stargate Command (“S.G.C.”), deep within Cheyenne Mountain in Colorado. O’Neill and Carter have been assigned to SG-1; Major Kawalsky will command SG-2. Teal’c seems to have been waiting for the right people to come along before he defected from the Goa’uld army. He believed that O’Neill and SG-1 would make formidable allies when he saw their level of technology (including O’Neill’s digital wrist watch),and learned that they were from Earth. The Goa’uld “gods” chose who would become their children. They presumably had mature symbiotes ready for joining, which they had procreated. Teal’c responds with a head shake of “No” to Daniel’s statement that “something of the host must survive.” If he is correct, and the Goa’uld parasite completely destroys the human soul and personality, Sha’re and Skaara may be lost for good. According to O’Neill, there are about 5,000 people living on Abydos. There are Stargate symbols instead of letters on the computer keyboard that controls the dialing procedure for Earth’s Stargate. Dialing is apparently as simple as keying in the seven necessary symbols. After traveling through the gate, humans experience a brief freezing sensation. There are 36 hours in a day on Abydos. A titanium iris has been installed over the Stargate. It allows a wormhole to be established, but keeps objects and people from being able to enter the facility through the gate. To instruct the S.G.C. to open the iris, each SG team is given a transmitter with a unique code. The S.G.C.’s targeting computer, using the Abydos map room information, can calculate two to three new addresses per month. Jack O’Neill – Upon returning from the first Abydos mission (“Stargate” the Movie), O’Neill filed a false report, stating that the Abydos gate had been destroyed and Daniel Jackson was dead. He also discovered that his wife had left him. She had forgiven him for the accidental shooting death of their son, but could not forget it. As for O’Neill — he says that he will never forgive himself, but sometimes he can forget for awhile. O’Neill returned to retirement, but has been reactivated to command SG-1, the first elite Stargate team under the jurisdiction of the United States military. It is the sort of thing that O’Neill is use to: most of his work over the past ten years is classified.Colonel O’Neill is from the city of Chicago. Daniel Jackson – Now married to Sha’re, Daniel spent over a year with the people of Abydos. After helping to defeat Ra, Daniel was treated as a savior by the people. Now, his wife has been abducted by the Goa’uld Apophis, and taken as a host by a parasitic alien. Daniel promised his friends on Abydos that he will return in one year; if he does not, they are to bury their Stargate forever. Finding Sha’re has become Jackson’s one mission in life. Samantha Carter – Carter, an Air Force captain and accomplished pilot (logging over 100 hours in enemy airspace during the Gulf War), is a theoretical astrophysicist transferred to the Stargate program from the Pentagon. Carter studied the gate for two years before Daniel Jackson made it work (“Stargate” the Movie). She is a confident and capable soldier, struggling to be considered an equal in a man’s world. Teal’c – Teal’c is a Jaffa, a soldier of the Goa’uld Apophis. He was, in fact, the first among Apophis’ guards. As a Jaffa, he has carried a larval Goa’uld within his belly since childhood. The alien within him gives Teal’c perfect health and long life. Teal’c has become disillusioned with the Goa’uld and the terrible things that Apophis does. He turned on his fellow guards and helped SG-1 escape with a large group of refugees, and is now likely a wanted criminal among his people. Teal’c has been recommended as a member of SG-1 by Jack O’Neill, though his final status is undetermined. George Hammond – General Hammond replaced General West as head of the Stargate program. Hammond is a career military man, and is stern but fair. He is on his last tour of duty, and is thinking of writing a book. Major Samuels – Samuels is General Hammond’s executive officer, and presumably the number two man in command of the S.G.C. He is less trustworthy, and anxious to give up SG-1 and SG-2 rather than further risk contact with the hostile aliens. Samuels seems to believe that the Stargate’s very existence is too great a risk for Earth. Charles Kawalsky – A member of the first Stargate team, Major Charles Kawalsky has been assigned to command the newly-formed SG-2 unit. His team supported SG-1 in attempting to retrieve Sha’re and Skaara from the Goa’uld, and in freeing several dozen prisoners. During the battle, though, Kawalsky was infected with the Goa’uld from a fallen Jaffa soldier, and now appears to be under its control. Sha’re – Daniel Jackson’s wife for more than a year, Sha’re is the daughter of the leader of Abydos, and the sister of Skaara. She is beautiful and caring, and has been abducted by the evil Goa’uld Apophis. She was selected as a host for Apophis’s queen, and is now possessed by the Goa’uld parasite. According to the Jaffa Teal’c, Sha’re herself may be gone forever because of the joining. Skaara – Skaara is a close friend to Jack O’Neill, and helped to defeat Ra’s forces on Abydos (“Stargate” the movie). O’Neill looks upon Skaara almost as a son. Skaara is the younger brother of Sha’re, and the son of the leader of Abydos. He has been abducted by Apophis, and taken by a Goa’uld couple to be the host of their parasite offspring. Apophis – Bearing a striking resemblance to Ra, Apophis is a powerful Goa’uld and Ra’s great enemy. He is described in Egyptian mythology as the serpent God (his Jaffa soldiers wear a serpent symbol on their foreheads) who rules the night. Apophis’ parasite queen has taken Sha’re as a host. Why wasn’t the Stargate buried or destroyed when O’Neill returned from the first mission to Abydos (“Stargate” the Movie)? What determines the length of time that a wormhole remains engaged? Can it be terminated from either end, or only at the end that initialized it? Why wasn’t Captain Carter assigned to the first Stargate mission to Abydos? How many planets can be reached by the Stargate network? Why was there a Stargate map room on Abydos? Will there be other map rooms found on other planets? Or was Abydos of particular importance to the builders of the system? Where did the Stargates come from? Did the Goa’uld create them and place them across the galaxy? If so, how might they react to another race using their transit system? Have Goa’uld other than Ra visited Earth in the past? How do Goa’uld parasites procreate? Why did Teal’c turn on his own soldiers? What does he hope to accomplish by joining SG-1? How long does is take a Goa’uld larva to mature within a Jaffa? After removal, are the Jaffa given a new larva, or left to die? Does anything of the host remain when a person it taken by a Goa’uld parasite? If not, can Sha’re and Skaara ever really be saved? Has the Goa’uld that entered Kawalsky fully matured? What will become of Kawalsky, now that he is apparently infected by a Goa’uld parasite? Samantha Carter’s line about it taking “15 years and three super-computers to MacGyver a system for the gate on Earth” is, of course, a poke at the television role that made Stargate SG-1‘s series lead Richard Dean Anderson a household name. The line was actually improvised on set by Amanda Tapping. Both the producers and Anderson loved it, and it stayed in the episode. VOTE! How would you rate SG-1's "Children of the Gods?"